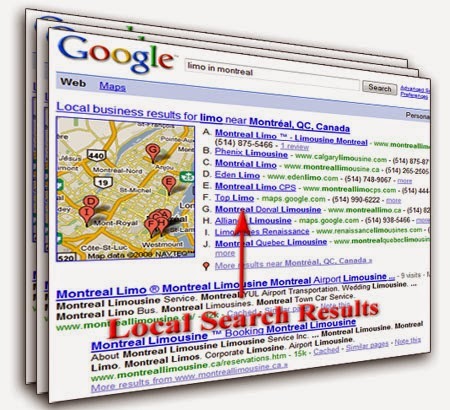 According to Google, 95% of the customers look for local businesses online. Another fact has it that 73% of online activity is related to local content. Since Google is the only search giant that boasts of a 66% share in the market, we can only assume the facts are accurate. But one thing is for certain - local businesses stand to gain much with online promotion. And since Google just released a new algorithm to provide more useful and relevant local search results to users, this area has now become very important for local business owners to look at. The new algorithm aims to provide more useful, relevant and accurate local search results that are tied more closely to traditional web search ranking signals. This means that they'll be ranked in much the same as normal search results. For now, the changes will only effect Google Maps and Google Web search results - no news or in-depth article results, no image or video results. According to Google, the new local search algorithm ties deeper into their web search capabilities, including the hundreds of ranking signals they use in web search. It also takes other signals into account, such as Knowledge Graph, spelling correction, synonyms and more. Furthermore, the algorithm is supposed to improve Google's distance and location ranking parameters, which means it gives local businesses such as shops, restaurants, and so on to attract a lot of local customers living nearby. Right now, the new algorithm is only being tested out for U.S. (English) search results. There hasn't been an update on if, and when Google will roll the update to more countries and languages. But it's gotta be soon, we estimate a few weeks or months at most. Right now, there has not been an indication of the percent of total queries impacted by this algorithm. Most of the changes are behind the scenes, but some local businesses may suddenly notice an increase or decrease in traffic, leads or conversions.